as always, it's been a busy week. however, i did have one full evening with nothing planned, and it ended up being the most beautiful & relaxing time i have had in a long while. as i get older, i think i am more fully able to grasp the concept of sabbath & how important it is to our well-being! since experiencing a tiny bit of that this past week, i made the decision that i will always keep one evening free in my week. it will be a time for me to sit and unwind and relax...it's so healthy! coffee and dinner and appointments can be pushed to the next week. make sure you are taking time to take care of yourself. you're no good to anyone else when you are exhausted and stressed out of your mind! the creeping crud found me on wednesday and has yet to release it's nasty hold. like a true idiot, i forgot to close my window when i fell asleep that night, so i was inhaling the yellow dust (refer to previous post) for a straight 8 hours. not surprisingly, i woke up the next morning hacking up a lung and barely able to breathe. i have been drinking so much water and hot tea, but i still haven't been able to kick it. the best way i can describe it is to have you imagine what it would feel like if your throat was lined with sandpaper. it's really disgusting...and pretty much the worst thing that could happen to a teacher when you have to really project your voice to 5 or 6 classes each day. by the end of the teaching day on friday, i thought i was gonna die. so moral of the story: if you are a teacher or a singer, avoid korea - or any asian countries, for that matter - in the springtime! several weeks ago, i met a missionary couple who've been serving in india. korea is home for them, so they are here on a short sabbatical til may. we really hit it off and have kept in contact since we first met. their english is really good and they are just sweet, sweet people. we were able to meet for dinner and coffee this week, and it ended up being a 3 or 4 hour ordeal! we kept talking and laughing and enjoying each other's company until we realized it was getting really late. i will miss them when they return to india in a month or so. :( they have a difficult ministry there, so be sure to keep them in your prayers. we had birthday week this week, with 2 of our native english teachers celebrating another year. tim got a double celebration with euchre on wednesday and dinner/cake on thursday. we celebrated john's birthday yesterday with some homemade mexican food and noraebong, or korean karaoke. 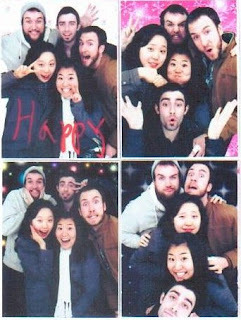 soo-in recommended that we also try the korean photobooths. they are just like those machines you see in the malls back in america, but they are really, really popular here. koreans love to take pictures of themselves...enough that my cellphone comes with 2 built in cameras - one in the back (like normal), and one in the front to take pictures of yourself! hahaha. 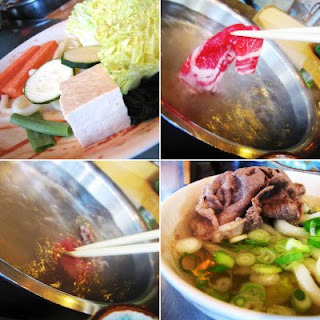 i experienced a new dish this week: shabu shabu. you can see a recipe here. basically, you start with a hotpot of vegetables and broth that is boiling hot. then you cook thin slices of beef in the pot. once most of the beef and veggies are gone, you dump in a big pot of noodles to cook in the hot broth. at the restaurant we visited, once we finished the noodles, they brought us a huge pot of fried rice. i thought i was going to explode but it was so delicious. time to shower and get ready for my day. hopefully i will defeat the yellow dust death today. everyone enjoy your week! let's just suffice it to say that i was less than amused when i woke up in the morning and saw this out my window. in korea, they don't really plow or ice the roads. so everything just turns into a big slushy, brown mess. thrilling when your morning commute includes 20-30 minutes of walking and a 30-40 minute busride! i have heard great things about korean springtime...ready to judge that for myself. it'd better make this looooong winter worth it! this week started out pretty tough. things got pretty messy at one of my schools as far as politics and hierarchy within the faculty. a couple of my teachers got into an argument (all in korean, while i was in the room. awkward.) and the vice-principal got involved and it was just disastrous. terrible day. luckily, i have a great church family and my pastor's wife must have sensed that i needed a reprieve that evening! she called me that afternoon and asked me to go to dinner with her family. i was so grateful - and it worked out great, since i just happened to have that evening free - which NEVER happens! we had a pretty hilarious conversation because no matter how fluent their english may be, koreans find phone conversations SO confusing. it's really baffling to me. they can have near perfect english, but if they cant see your lips moving, it's like they forget all of the english that they know. 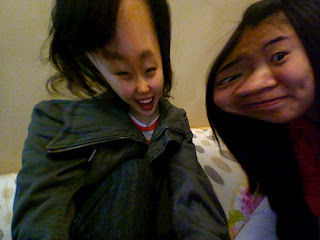 phone conversations with koreans are always really promising - hahaha. anyways, eun-sol called and asked me to dinner and said that they planned to eat samgyupsal. i've mentioned this before - you should google it! its basically a really extremely fatty bacon. its delicious but gross at the same time because there is SO much fat. i told eun-sol that samgyupsal would be fine and asked details about when and where. she responded with "ummm-we should eat samgyupsal because it is windy outside." i paused as my brain tried to process that. when i came up clueless, i said - "just to clarify, we should eat the fatty bacon because the weather outside is windy?" she said - "yes. because of the wind and the dust from china." my brain was about to break by this time...i had no idea what the heck she was talking about. but i didn't want to further confuse the conversation, so i just said - "of course! great! see you tonight!" i am 100% accustomed to being confused here in korea. there are lots of customs and traditions and things about the country that i don't understand. then you add in the language barrier and it's just the perfect equation for some priceless comedy. i've gotten to the point where i don't even ask questions anymore because sometimes it's just not worth the confusion. but i could not understand the fatty bacon/wind thing. so i asked my head teacher - "ummm. quick question. is there some kind of connection between samgyupsal + some chinese dust + wind?" after she laughed at me, she explained. there is a yellow dust pollutant that originates in the mountains of china. on really windy days, it is blown all over the place - korea being one of the lucky winners. it wreaks all kinds of havoc on your allergies and causes all kinds of sore throats and sickness. koreans have a belief that when you eat the samgyupsal, the fat will kind of absorb all of that nasty dust that you have inhaled and help your body purge it so you can avoid sickness. so, eun-sol was trying to watch out for me and keep me from getting sick by inviting me to eat samgyupsal. it makes alot of sense when it's explained, right? not so much when you're trying to talk to a korean on the phone and all you have to go on is something about eating fatty bacon because it's windy outside. hahaha. i am confused all of the time here, but this one was a doozy. so funny! for more info on the yellow dust, you can check wiki. partially because of the yellow dust/partially because of exhaustion/partially because of culture shock/partially because of all other sorts of factors, ALOT of the native english teachers have gotten really sick this week. anything from severe allergies to bronchitis to stomach flus to anything you could imagine. it's really terrible! i hate seeing my friends sick. i have managed to stay healthy because i've been taking so many vitamins and drinking so much tea/water/orange juice and getting alot of sleep. fortunately, with our health insurance + korean healthcare, it costs anywhere from 50 cents-2 dollars to see a doctor here. the idea of going to the dr and paying with a coin is really baffling to me. and prescription drugs typically cost somewhere from $3-$10. really crazy and so different from america! but great since alot of the teachers needed it this week - it's so affordable for us! please pray that everyone will be able to kick the sickness this week. it's hard enough trying to adjust to a new place and a new language and a new job without having to deal with illness, too. john and i decided to take a trip into seoul yesterday to do some shopping. after we bought the train tickets, i checked the weather and saw that it was supposed to be cold/windy/rainy the whole day...and i was instantly grumpy. hahaha. rain is not very compatible with outdoor shopping. luckily, God had mercy on us and gave us a wonderful day! it was cloudy, but that worked to our advantage because it was much less crowded. i never even had to get my umbrella out - i was thrilled! we shopped til we dropped and went to SO many different parts of seoul...which is a HUGE city! here is a subway map to give you a sample: it looks kind of complicated, but is SO easy to navigate. the public transportation here is really superb. so we were hopping subways and switching lines all day. really exhausting! luckily the two of us travel really well together. when thrown into a stressful situation like that and trying to navigate a complicated system that is easy, but still unfamiliar, things can get kind of explosive. i'm sure all of you have been in a situation like that and can understand. :) but john and i got along perfectly well the whole day without even having to yell at each other. hahaha. teamwork is the key. it was wonderful! on the way back to cheonan, we decided to pitstop in songtan because we had heard rumors of mexican food there. songtan has a main strip that is located right outside of a military base, so there are few koreans in that area. i was NOT prepared for it. i swear - we got on the subway in korea, and got off in the twilight zone. it was like we had been magically transported to some weird american city. there were all of these caucasians and everyone was speaking english. i was so weirded out! i have said for about a month now that i think the culture shock of returning to america will be much harder for me than anything i experienced coming here to korea. last night was proof. yes, returning to american culture is going to be insane. we walked into the mexican restaurant and a korean server greeted us with a "hey, how are you guys? just 2 tonight?" and my eyes just got so big. again, my brain almost broke. so strange! i am so used to giving a slight bow with an "annyeonghaseyo" and a "hana/tul/set/net" for the # of people in our party. the mexican food was definitely worth it -- so delicious! but i was ready to get out of that place and back to korea. one of the weirdest twilight zone-types of experiences i have ever had. it's 8.30am sunday here so i should probably get ready for church. my wonderful pastor and his wife traveled to costco yesterday and picked up a few groceries for me while they were there. i can't wait to claim my big tub of peanut butter and flour tortillas and salsa! :) i hope you all have a wonderful week...enjoy the sunshine and warm temperatures for me!! here is a little bonus update for you...2 in 3 days - wow! 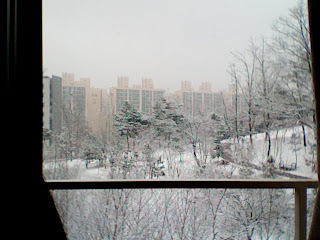 i wanted to write a bit about the korean school culture. the way i see it, american students are living the dream! korean students undergo serious standardized testing, beginning at a very young age, which is stressed as being one of the most important things ever. the tests are important the whole way through grade school, but start to be really prominent in middle school, when your test scores decide which high school you will go to. each school has a different level of prestige, so the higher your test score, the better school you will attend. it's like taking the ACT for college, only when you're a 6th grader! i could barely handle that pressure as a high school senior, so i'm sure i would buckle as an middle schooler. korean students are under alot of pressure to study hard and get the best grades they possibly can. this is partially highlighted by their saturday school attendance. yep, koreans attend school every other saturday, in addition to their 5 day week. i can't imagine the uproar that would occur in the states if we tried to make our kids go to school on a saturday. as far as english is specifically concerned, parents put a lot of pressure on their kids. many students attend public school for a regular school day until about 3 in the afternoon, then go to their hogwan, or private institution, until later at night...sometimes 11pm! after hogwan, they do their homework and sleep for a few hours before starting all over again. this is seriously crazy to me. alot of the kids are working so hard so they are constantly exhausted. you can really see it on their faces when they are in your classroom...i feel so bad for them! but learning english is pretty highly emphasized in today's korean culture...i suppose i should be thankful for this, since that's the reason i'm able to be here now. the kids are so sweet, and as i mentioned before, must really respect their teachers and superiors. i still can't get used to having students bowing to me all the time...it's so strange! now that the kids are starting to get to know me more, they are gaining bravery in coming up to talk to me. they love a chance to practice the english that they are being forced to study so diligently. i constantly have kids running up to me, and lately, bringing me all sorts of candy. i'm gonna blow up like a balloon here! but they are so happy to be able to give you something...they always say "teacher! here! for you!" i met a new korean friend this past week - her english name is miranda. she is an english major at KNU, so naturally, she loves a chance to practice the language. 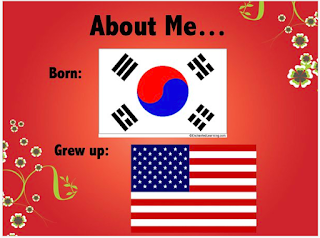 her goal is to become fluent enough to be a korean/english interpreter...wow! she is well on her way, though. i was very impressed by her english level. we were able to have tea together this weekend and she is so sweet. her family lives on jeju island, which is sometimes referred to as "korea's hawaii." she asked me to come home with her this summer so we could go to the beach together. needless to say, it didn't take much convincing. hahaha. as long as our breaks coincide, i will be spending sometime there in a few months...woohoo! miranda also asked if she could give me a korean name. she chose 보영 or bo-yeong. i'm not really sure why, or what it means. hahaha. but she said it was cute, so it should be my name. there you have it. one of the first questions a foreigner will get from koreans is - "do you like korean food?" they are always amazed when you answer with an affirmative! they get really excited and always ask, "isn't it too spicy?" then "what is your favorite food?" when i first came to korea, eun-sol, pastor's wife, asked me about my favorite food and i told her it was rabokki. she apparently has the world's best memory, because yesterday after service, she said, "whitney! i made rabokki just for you!" she brought me out a huge bowl of it, and i was so excited. hahaha. i ate the whole thing, and i must say...it was some of the best rabokki korea has ever seen. afterwards, one of the other ladies in church invited me to her house in april to cook korean food with her. i'm pumped! i can't believe it's already been a week since i last updated. time is absolutely flying here as i am running around like a chicken with my head cut off! as i have mentioned earlier, nothing in korea is set in stone and ANYTHING is subject to change. you really can't plan ahead here because something will happen and your plans will be rendered useless. in typical korean form, alot has changed since my last post! i went into work on monday and found out my schedule at bongmyeong was adjusted. i will not teach grades 3 and 4 with ms. sarah...now i only teach 5th & 6th graders with ms. cheon. ms. cheon, the headteacher, said that she and the vice-principal discussed it and decided that it would be best that way. i'm really not sure of the reasoning behind that, but since i only teach 5th & 6th graders at sinan, i will never have grades 3 or 4. kind of sad, but grades 5 & 6 are definitely enough to keep me on my toes. i was still meeting new students this week, so i gave my introduction PPT about a gazillion more times. every class has their own personality, so you never know what kind of reaction you will get. some kids are mildly interested, but don't really care enough to ask any questions at the end when Q&A comes. other classes are about to jump out of their seats with excitement and they have more questions than one period can handle. all of my students are great, though, and i really look forward to this year with them. one of my favorite moments was on friday in a 5th grade class. i had finished my PPT and was taking questions. most kids ask things like "do you play sports? do you like kimchi? what's your favorite animal?" but one of my students raised his hand and said "uhhh...whitney teacher? your thumb is a lot longer than our thumbs...why?!" hahaha. not a question i was prepared for! how do you explain something like that to a 5th grader with an extremely low english level? i threw around a few options in my head, then decided upon "i was just born that way...but really good observation!" in hindsight, i see that this was probably a terribly insufficient answer. this is how people get crazy ideas in their heads. i can picture my students growing up thinking that all korean adoptees have weirdly long thumbs. hahaha. i have a lot left to learn about teaching! this week was honestly pretty difficult. coming to korea, everyone was preparing me for the worst...saying that koreans' reactions to me might be pretty negative. i have been surprised to find the opposite to be true...all of the koreans have been overly excited and welcoming and helpful! this has turned into a bajillion people (who i feel indebted to for their gracious hospitality) vying for all of my time and attention and energy and affections. it's really draining! everyone has been so wonderful but i've realized that i cannot be best friends with everyone i meet...i feel like i am being pulled in a million different directions at once. this week saw little sleep, alot of running around, severe exhaustion, and serious stress. my schedule for the upcoming week is already full. :( time management has never been a problem for me, as i perfectly demonstrated my senior year of college while i finished out a business degree, ran an apt breezeway as RA, filled the position of senior class president, worked in the office of admissions, and sat on various committees...while on crutches, tending to a broken ankle, and attending physical therapy 3 times a week. this time it's a whole new experience, though, and i have to admit...i'm struggling! i am working hard to find a perfect balance between time with my close friends, time with other American teachers, time with new Korean friends, time for laundry and errands, time for myself...and the list goes on! i have obviously been doing a terrible job of it, as i have been super stressed out trying to figure out my next appointment. please pray that i can get this beast under control...and fast! i've also come to the conclusion that the vice-principal at one of my schools hates me. he has not made any attempt to say hello to me or even acknowledge my presence at anytime these past 2 weeks, so it seemed a pretty safe bet, but he solidified the idea this week. i was at lunch with my head teacher in the insanely loud cafeteria, and we were just unwinding after a crazy morning of classes, laughing and chatting and getting to know each other. the principal and vice principal came and sat at our table a seat or 2 down. we bowed and said annyeonghaseyo then continued to eat and chat. after a few minutes, the vice principal leaned over to the head teacher and said something in korean. she told me later that he said we were annoying him by being too loud. this is an absurd thing to say in an elementary school cafeteria where you can barely hear yourself think, and my teacher reluctantly said it was probably because we were speaking english instead of korean. i found out that he doesn't really think the english program is necessary and really kind of hates the idea of a native speaker being there. this is a challenge since i have to see him every week for the next year, so keep this situation in mind. most of korea has been very welcoming, but this is definitely not the first time i have met a korean who is less than enthused about my mere existence. this fella showed dad up and stole the limelight. my brother jeff & his wife amy welcomed nicholas ritter casey to the world on monday 3/8/10. he was a chunker at 8 lbs. plus, but everybody is doing great. i am ready to meet him once i return to the states in a year or so! hope this post finds all of you healthy and well. please drop me a line with an update on what's happening on your side of the world! i seriously thought long and hard about this...how do you explain such a confusing concept to young kids with a low english level? the best answer seemed to be "use visuals" and this was all i could come up with. it seemed to work, though, and the kids were so gracious and receptive. they were thrilled to be able to run up to me and practice "hello" and "goodbye" in the hallways. they are so cute! it's a really strange thing...being a foreigner. especially in a culture like korea, with such a rigid hierarchy. elders and superiors are respected, and that's that. i'm not used to having people bow to me...and likewise, i'm not used to bowing to others! my favorite is when the kids run up to me and bow. but then they get really nervous to use their english or really don't know any at all, so they just keep bowing. over and over and over again. hahaha. it makes me dizzy! on wednesday, i asked ms cheon about lesson plans and class structure and she gave me this shocked look. her exact response was: "i do not want you to be burdened with the planning! you are new here and you should be comfortable! i will teach and you will just be my helper. you will walk around when we have group activities and help the children if they have questions." so basically i have the easiest job ever. no lesson planning. i will "assist" 3-5 hours per day, then sit at my desk for the remaining 3-5 hours of the day. this is such a good chance for me to study korean! i hope i use the time wisely and don't waste it...discipline is the key! on thursday and friday, i work at sinan elementary school. i will spend 10 hours teaching there (5 hours each day) and then run an after-school free-talking session with the really bright english students. it's a great way for them to interact with a native speaker and practice the vocabulary they are learning in the classroom. i am actually getting overtime for the after school sessions, so i will also get overtime pay. nice! my teacher there is named soon-joo, and she is also awesome! i got so lucky with my schools...i really couldn't ask for better head teachers. my job is really easy at sinan, too. i will mostly be responsible for games. i just use the lesson taught by soon-joo and design a game that will reinforce the new vocabulary words. i am really excited about the free-talking classes and i hope that i can help the students grow in their english abilities. i had alot of really interesting things happen that were school-related this week, but they are too numerous and long to share. in summary, one of the directors of sinan offered to allow me to move into her house and live there for free within an hour of meeting me, one of my co-teachers at bongmyeung officially adopted me as her little sister and made me hug it out in the middle of a crowded walmart-like store, and i was offered soju shots by the head of bongmyeung at our faculty dinner (which happened to be roasted duck...delicious!). needless to say, it was a week to remember. one of the first questions asked by one of my many co-teachers was: are you a christian? since i gave her an affirmative answer, she has been asking me alot of questions. she tells me she is really interested in the bible and christianity, but not sure that she is ready to really commit yet. she has already completed a one-year beginners bible study and will soon begin the intermediate bible study. i am so nervous because i know that she is watching me like a hawk...just trying to get a good feel for what the christianity thing is all about. i hope i don't do something stupid to really screw up such a prime opportunity. she is really curious and i just pray that i can help continue to steer her in the right direction. would you guys pray for both of us also? with all of the great things that have happened at work this week, i still love getting to spend time with the other native teachers. 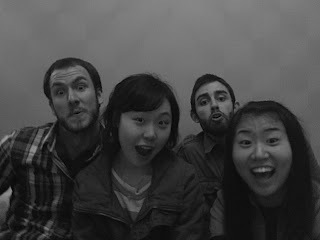 we pow-wow'd on thursday night to swap stories, encourage each other, and just have fun together. i really love these people! friday night, john, ben, andy, and i cooked up a delicious fiesta. we spent the evening unwinding with tortilla chips and chimichangas and tacos. it was beautiful! and tonight a few of us spent hours talking over pizza and cokes (with a little break for wii sports). i genuinely enjoy these moments...they are what bind us together and make us family. i also got to spend some time with soo-in today. she is so sweet! she shared stories about her first week as a sophomore at university and i told her about my experiences as a new teacher. we laughed and sympathized and discussed with each other...it was wonderful! she continually blows my mind with her english abilities...she really gives me hope! 1-that it's possible to become really fluent in a second language, and 2-that i can help my students develop a strong foundational english that they can build upon during their middle/high/university years. also...we just have alot of fun together! she asks me questions about english words she has heard but needs clarity on, and i ask her ridiculous questions about korean. hahaha. i don't know how she puts up with some of the dumb things i ask her. she's a saint! as a final story, all of my teachers meet me and say "wow, you look very young!" hahaha. but they have explained that this is a good thing...that the students will really love me and that everyone wants to keep their youthful look. on friday, i was in the cafeteria and had just gone through the line and was walking towards my table, when i heard a korean yelling behind me. the lunch lady had literally chased me across the cafeteria to my table carrying a huge soup ladle. i was so confused. but she came to me and said "sonsangnim?" or "teacher?" and dumped the whole thing of soup in my bowl. come to find out, she thought i was a student (at an elementary school, mind you!) and had only given me the student portion of food, instead of the teacher portion. hahaha. it was hilarious. i expect stuff like this to happen often. i love those moments. lots that i have left out, but there will be lots more to come as i go into this next week. please pray for me as i continue to situate myself and really start interacting with my kids this week. i have over 1000 students total that i will see every week, which is scary and overwhelming and awesome and exciting all at once. i hope all of you are well...please drop me a line when you are able! whcasey@gmail.com or facebook me. be strong and courageous. do not be afraid or terrified...for the LORD your God goes with you; he will never leave you nor forsake you.